Forecasting the future of supply chain technology has more to do with events that drive change, than philosophizing on vaporware. The technology of supply chain's future is already here. But how will it get implemented? I have interviewed industry leader and analysts, sat in with technology research firms, and talked with supply chain customers. As an entrepreneur in this space for 14 years, the future of supply chain technology is the standard topic on my mind. It is the standard topic of many GTBP readers. We are looking to best position our assets to maximize return. That is the definition of supply chain. SaaS and cloud computing, visibility and collaboration, consumer-centric demand driven networks, single connection networks for trading partners, extension of mobile apps, demand metrics, data mining, BPO, and social media web 2.0 threaded conversation tools. The GXS blog does a nice job digging deeper into these areas as it affects the B2B EC area. here Also AMR Research (now a part of Gartner Group), has a few presentations online that deal with demand-driven retailing. Many of the benefits that these technologies are looking to provide have evolved from initiative built over the last 15 years: big ERP, ECR - Efficient Consumer Response, EDI-INT, online product catalogs, synchronized databases, XML, viaLink, industry sponsored e-commerce exchanges, ASP, web EDI, EAI, RFID, 3PLs, 4PLs, sourcing databases, Sparkice, Alibaba, Ariba, CommerceOne, and open source software. But what business, economic, political, social, demographic, and technology convergence trends might drive adoption? How about: big business mega mergers, growing number of multinational corporations, death of the single corporate career, off-shoring jobs, growing national debt, new taxation, the end of cheap money, financial crisis, recession, slow growth, healthcare overhaul, environmental sustainability, the end of McMansions and SUVs, new TXTing language, pandemic of autism and dietary issues in children, being green, unemployment, slow US population growth, an aging population, baby boomer retirement, Internet mobile connectivity, social web media, and information overload. How might these trends impact B2B and supply chain? First, I see multiple government mandates, including the US, in the immediate (next few years) timeframe driving adoption from every company that touches a product. The VAT (value added tax) is a top tax revenue generator and the government is going to squeeze every penny out of it. To track the VAT, they will utilize an e-Invoice system similar to Brazil's model today. See America VAT coverage here. Also under the realm of government regulations, I see multiple compliance measures put in place to protect consumers and allow the government to audit the supply chain in cases of recalls. Some of this is already in place, with government wanting to know origins of materials, including packaging and processing machinery. Companies will be liable to track and store this information. There is technology in place to address this today. The Healthcare efficiency initiative has been the major news out of the Obama administration for the last year. A couple of publicly trading companies that do offer electronic medical records, and claims processing with insurance companies (coding), are Athena Health (Nasdaq: ATHN) and Quality Systems Inc (Nasdaq: QSII). Their stock has been soaring for the last couple of years. It is a different business than the product distribution space, but the healthcare industry could learn a lot from experts who handle the supply chain for major retailers. This market seems to be wide open with healthy margins. Last month I wrote an article on India Inc off-shoring services called Fleecing America. Click here for coverage. India Inc takes a pervasive approach in how they vest themselves into the contract. In billion dollar deals, they do more than promise ROI, they write it into the contract and pay millions of dollars to the customer upfront, to help seal the deal. This leading edge type of vested outsourcing is going to become how big outsourcing B2B deals are done. As this begins to take place, the big networks will be expected to leverage their contacts, knowledge, and best practices in the vertical industries that they serve, in order to further differentiate themselves. There is value in a network that maintains complex business process connections to a trading community. They become the B2B marketplace, and a Facebook for business. There are multiple horizontal services that can be offered on a network level. One example of these services is receivables based financing, commonly called factoring. The first thing that factors want to see to calculate risk is history of business. Lower risk brings the cost of financing down. CIT is a small shadow of its previous self. Banking fees are increasing and cash is becoming tighter. I foresee growing demand in this area. Check out what The Receivables Exchange is doing in this space here. Another value of the large B2B network is the ‘visibility and collaboration' component. The networks are in a position to offer standardized demand metrics. As the majority of transactions go through them, they have a data mining opportunity. By becoming the database of an industry, they are also enabling their clients to outsource the updating of master data and master supplier information, right back to the supplier. You therefore end up with synchronized data and accurate invoice transactions. This becomes particularly important when companies begin to become liable for taxes based on invoices sent electronically. Furthermore on ‘visibility and collaboration', imagine a business Facebook to manage the performance of tasks given to multiple business trading partners groups. Today, this process is a fairly disparate system of email, spreadsheets, mainframe programs, and pc documents. But to have the centralized platform or B2B marketplace, and to engage your trading partners, is of value. Again, technology is here with business adoption soon to follow. There seems to be an awful lot of business intelligence companies in the market today. Many of them specialize in a certain niche. The ones on the demand planning side analyze: POS (point of sale data), market basket, loyalty card, demographics, pricing, promotion, and third party databases like Acxiom. Other BI vendors focus on the supplier and logistics side of the equation. Those solutions help you to measure and manage their performance while opening up information to share demand visibility upstream. BI is another value add of the large B2B networks and previous EDI VAN(s). Transactions and business processes can be data mined, re-sorted, and made into real-time business intelligence custom designed with the receiver in mind. For the small and mid-size businesses, there is value to be able to have a mini-ERP, already preconfigured and connected to your customers. Imagine that you are a small food processor who sells canned healthy soups to Wal-Mart, Wegmans, Kroger, Bashas', and a handful of other big customers that do EDI. You could go to Netsuite, and for a marginal monthly fee, be in business electronically with your trading partners, integrated with the accounting books, in a matter of days. Netsuite does this through a partnership with SPS Commerce. Again, this is today, but a growth area for the future. Industry consolidation which was big news in 2009, will continue to be big news in 2010. Expect to see some of these companies, Microsoft, IBM, Oracle, SAP, CA, Sage, Intuit, Salesforce, Netsuite, enter the B2B fold with investments and acquisitions. SAP has made an investment into Crossgate. Microsoft has been figuring out how to enter the market for ten years. While basic communication mailbox VAN service is mature and considered a commodity, the new ‘value adds' are in: BI, visibility, collaboration, on network data transformation, community management, outsourced synchronized master data and trading partner management data, international e-Invoicing compliance, 3PL network services, banking and factoring, And EDI too. All of these areas are automated (and many times supplemented) with a company's central ERP system. While over the last 15 years, the Internet and new protocols have completely blown apart the tight little industry EDI once was, the central VAN network has reined. It has been a Chasm crossing, but we have learned a lot. For instance, businesses will never agree on a standard data format. A third party translation/transformation network hub is a necessity. While the Internet has inevitably destroyed the VAN KC revenue model, drove down margins, diminished revenues, which led to industry consolidation, the industry group going forward will be as irreplaceable as your mobile phone. Folks ask me, "Why are you still interested in the EDI space? It's not a wide spread scalable business model and the industry leaders are shrinking." I see the VAN networks assets growing in value. I see every business needing to connect to the VAN to commence business in the B2B marketplace. They have laid the lines and own the infrastructure. The industry is still an adolescent and I cannot think of a better place to be long term. Twenty years from now, the VAN(s) will be a target for trust-busting. Now back to one of the first question, how does one best position himself to make the greatest impact? That's a question I'll send to Bob, Bob, Sean, Tom, Archie, Mark, Paul, Scott, and Rob? On the facebook of B2B, I see the breakdown of the boundaries in the supply chain as bigger than risk management applications. If you follow the Enterprise 2.0 trend lines and apply them to B2B, you'll see the the rails getting laid for a radically new way of dealing with multienterprise business process execution. Think linkedin meets thingamy. On cloud BI, I had a compelling conversation with one of the nations largest "blue chip" VCs. They made the observation that the cloud BI opportunities that were winners were "purpose built analytics, where the provider already has the data (information asset)". 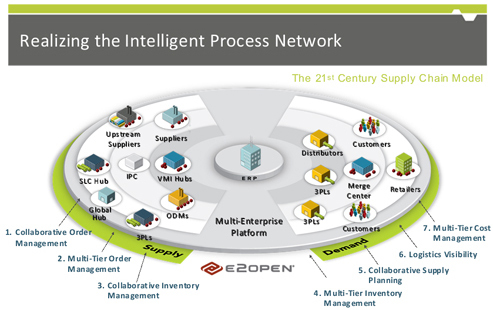 In the supply chain, the marketplaces, vans, and BPO vendors have the data (enterprise and multienterprise). They also have the process context. The combination means they can execute on the purpose built analytics that will constitute the cloud BI opportunities. On VAN Mailbox commodity, there is a bigger force at work. Think of VAN Mailboxes as a single simple integration pattern out of many. There is a huge integration convergence movement at work (AMR and Gartner have both been tracking it as well). These larger footprint SaaS integration solutions will displace ad hoc mft, mftaas, vans, data rooms, and many other niche integration businesses. Axway has been thinking about it (look at their latest messaging) and they aren't even in the SaaS business! On translation in the cloud, I agree it is the absolute future. The problem is that while we may agree on common data formats (maybe), we'll never agree on common semantics. That said, I think translation becomes a commodity as well. Look at what Boomi, SPS, Inovis, and others are doing with adaptors and canonical mapping. Look at what Snaplogic is doing with the snapstore (think long tail integration marketplace). Great article, but we see the VAN as something different. We view VAN itself being a commodity which is why pricing is decreasing at 20% a year even though volume is increasing by 20% a year. This was validated in further talks we have had. Where once I sold VAN for 12 cents a kc, I am usually under 4 on avg. and for large companies under 1 cent a kc. True a Sterling will say they have 300K endpoints, but get them to answer the question of how many end points are their owns and not part of the 90 Interconnects that there are. Agreed the VAN has a place, but we view the concept of mailboxing moving to the ERP system. The interconnect regulations means that I don't need to own a VAN, just be part of the 90 and I can access the 300K endpoints that have been built as a global community - they have basically canablized themselves for the good of the market - as global trade would not work without this unquestioned interconnect. We agree with the Facebook concept but view this built on the Internet not legacy VAN or X.400 platforms - yes will still interconnect, but we see pricing still going down. Our view is that the ERP vendors are the one to watch and that SAP and Oracle will make a large move as they own the Hub network. You will see some announcements on this in the next week or so, and I would be happy to do a joint session with you and SAP on the topic - I can't provide details until that press release is approved. What if a Google got into the Network space - the Telco's have tried with AT&T and Sterling and Verizon and GXS, but I have yet to see them maximize this. And, we have yet to see a strong play from the ERP vendors - yet -- but it is coming. Of course, this is just our view and mine - rest is exactly what we hear from our customer base. Up to twenty years ago product companies typically saw themselves as manufacturing companies, usually operated in a highly vertically integrated model. The supply chain function, if it existed, often meant the transportation guys somewhere deep in the organization. Today many product companies see themselves as "brand companies" that orchestrate the activities of many "partner" companies that perform the actual manufacturing, logistics, distribution, service and even design functions. Today many product companies are even operating in an asset-light model with zero or minimal actual inventory and facilities being ever owned by them. Today many companies have a "C-level" executive that owns end-to-end supply chain, and if there is any manufacturing, it is just one of the functions reporting in this organization. Today, it is becoming widely accepted that managing the entire supply chain, or maybe even better terms are "demand/supply network" or "customer value network", is a must-have competency for any product company. Good to hear from you. Fascinating think-piece you have. I enjoy the big thinking you explore. A couple concepts, I relish the thought of being the trust needing busting but there are many covenants that ensure that won't be pursued and is a core for us which takes me back to the challenge of aggregate data mining. I do believe you have a number of correct catalysts identified like VAT and government compliance accelerating adoption or strategies for extending the business system more to external entities both partners and government organizations. The evolution will be interesting, I think the final state will still need to evolve and I doubt the big software houses will have the appetite or patients to see the collaboration space through to a conclusion and most important, I don't think it will drive market share. To me the more likely is the space getting more firmly defined and developing as a service, it is specialized and each company gains very little from building their selves the capacity or competency. My sense with Nota Fiscal as an example is in the end the FI impact is managed in the ERP but the transmittal and interaction with the government is done outside the ERP and if your point about never reaching a standard is correct the service will always be the most efficient mode of delivery. The business understanding and requirements vary a fair bit by vertical market so I think the highest value service will be specialized enough by vertical or business type like, discrete manufacturing, process manufacturing, service industries and maybe healthcare to specialize in the unique collaboration needs of the business. Very interesting and full of good points. Thank you for the feedback. Readers, please add your thoughts below. I think we will see the delivery in the next few years of the promise that drove the emarkets and consortiums of several years ago, easy connectivity and the ability to have it the way you want it at a reasonable cost. 5. I can have the way I want it, not the way your software or data model tells me I have to have it. This will have aspects of ERP, social networking, VANs, etc to get to the point of success.